Birth Date note: Per the old book, "A Woman of the Century", birth date is listed as 1862. Per the website "A Celebration of Women Writers", birth date is listed as 1852. "A History of English Literature in a Series of Biographical Sketches" also gives the date as 1862. Leah Glasser's biography cites 1852 as a birth date and has Eleanor starting school aged seven in 1859. Michele LaRue reads from The Apple Tree: A Celebration of Spring and Poor Housekeeping. Mary Ella Wilkins was born to a devout Congregationalist family in Randolph, Massachusetts. Her father, a carpenter, moved the family to Brattleboro, Vermont, in 1867 to open a dry-goods store. She attended Brattleboro High School and then studied at Mount Holyoke Female Seminary (now Mount Holyoke College), in 1870-71. After her father's business failed, her mother Eleanor had to go into service in the home of a local clergyman, taking Mary with her. 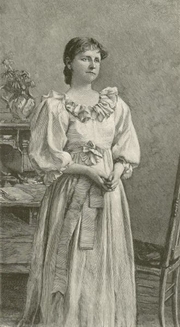 Mary worked as a secretary to Oliver Wendell Holmes, Sr., and began writing children’s stories and poems. Following the death of her mother in 1880, she adopted the middle name Eleanor. In 1883, she published her first story for adults in a Boston newspaper. Within a few years, she was recognized as an important and influential writer. Mary Eleanor Wilkins moved back to Randolph to live with friends after her father died. In their secluded farmhouse, she wrote her stories and novels steadily for 20 years, often working ten hours a day. Her best-known collection may be A New England Nun and Other Stories (1891). In 1902, at age 49, she married Charles M. Freeman and moved to Metuchen, New Jersey, with him. They separated in 1922. Much of Mary's work depicts the life she knew in New England hill towns and often features spinster heroines or abandoned children. Some of her ghost stories are often included in anthologies, including "Luella Miller" and "The Wind in the Rose-Bush." Mary E. Wilkins Freeman and Edith Wharton became the first women inducted into the National Institute of Arts and Letters in 1926. Mary Eleanor Wilkins Freeman's book Dracula's Guest was available from LibraryThing Early Reviewers. Mary Eleanor Wilkins Freeman is currently considered a "single author." If one or more works are by a distinct, homonymous authors, go ahead and split the author. Mary Eleanor Wilkins Freeman is composed of 17 names. You can examine and separate out names.